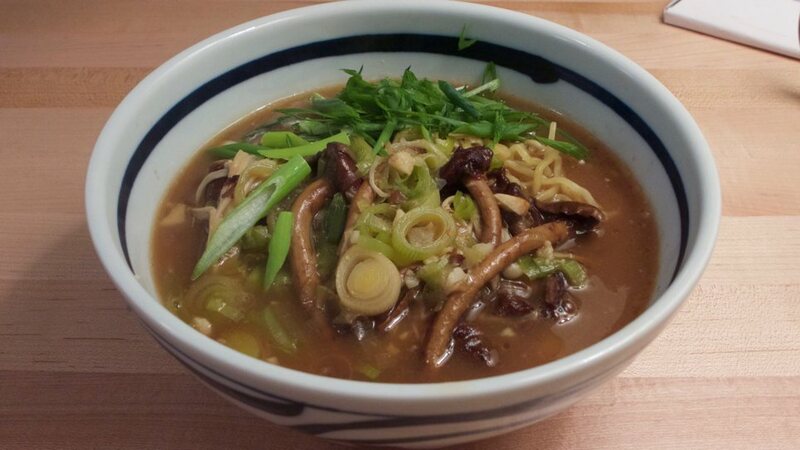 Egg noodles, scallions, leeks, enoki mushrooms, and a soft-boiled egg (not visible) in a red miso supreme stock. A year ago, I purchased pig trotters from the local farmers market figuring that I could use them to make stock. Never having made a stock with trotters before, a year later, I finally called my grandmother in Hong Kong, showed her the trotters over FaceTime, and asked her what to do with them. While describing preparation techniques, she warned me that I would either have to burn off or pull out hairs from the skin of the trotters. I was not expecting this particular step with the hair and skin. Fortunately, the farm that I bought the trotters from had already removed all of the hairs and spared me the hard labor. After confirming that the trotters were indeed hairless, I proceeded to start the ten hour process of making a supreme stock for ramen. A “supreme” stock is simply one made from a combination of types of meat. In many Chinese restaurants, chefs will keep a pot of supreme stock on the burner to thin out sauces or to create rich slurries to coat stir fries. My parents and I have a recurring joke about supreme stocks: whenever we eat out and order a dish with supreme sauce, I’ll ask them, “Does this stock have the master ingredient?” And then they inevitably reply, “Of course. Why do you think it’s so tasty?” The master ingredient is neither chicken carcass, nor pig trotter, nor leek, nor scallion, nor onion, nor ginger…it is monosodium glutamate (MSG)! I have nothing against MSG, but I don’t stock it in my own kitchen. To create a medley of flavors for my ramen stock, I first browned leeks, scallions, and onions. While waiting for the veggies to brown, I brought a stock pot of water to boil with the pig trotters. Everyone warned me that the pig trotters would release a brownish, grayish “scum” after the initial boil, and that cleaning the bones after the initial boil would stop the trotters from releasing any more foam and film. So, I took to the sink with my stock pot and trotters after the initial boil, grabbed a single chopstick, and started poking into the bones of the trotter. I must admit that I found this step mildly relaxing and odd. 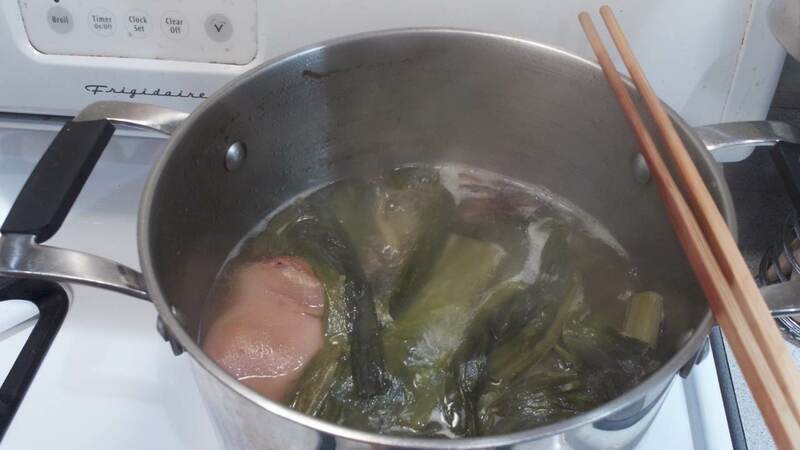 Making a supreme stock with pig trotters, the tops of leeks, red onions, scallions, ginger, and chicken stock. Over the course of ten hours, the stock thickens substantially as the trotters release their gelatin. After finishing rinsing the trotters and browning the veggies, I combined everything in the stock pot and topped it off with frozen (now thawed) chicken stock that I had made a few nights before. I regularly hoard chicken carcasses for the explicit purpose of making stock, and Nathan regularly makes fun of me for hoarding both carcasses and stock. I found the remainder of the process mostly familiar: bring the contents of the pot to boil; lower heat to a simmer; skim off fat; add water if necessary. For this first iteration, I waited about ten hours for the gelatin in the trotters to thicken the stock. I believe that some ramen shops will simmer their bones and carcasses for almost a full day…but I did not, given my own practical need to sleep and not set the apartment on fire. To actually turn the stock into a meal, I strained everything into a dutch oven; added chopped garlic, leek, enoki mushroom, and red miso; and brought everything to a boil before dropping in egg noodles. To garnish, I added a soft-boiled egg, scallion, sesame oil, soy sauce, and white pepper. Finally, because I didn’t have any pork belly, I breaded and fried pork chops as a substitute meat side for the noodles. The chops were slightly tricky to cook, given how thick they were and how much oil I had in the skillet. But, in the end, they finished crispy on the outside, and moist/done on the inside (according to the meat thermometer). Given that I mostly cook with ground pork and whole chickens, I found these two first time experiments with trotters and chops surprisingly simple and indulgently tasty. The pictures sufficiently impressed my parents. 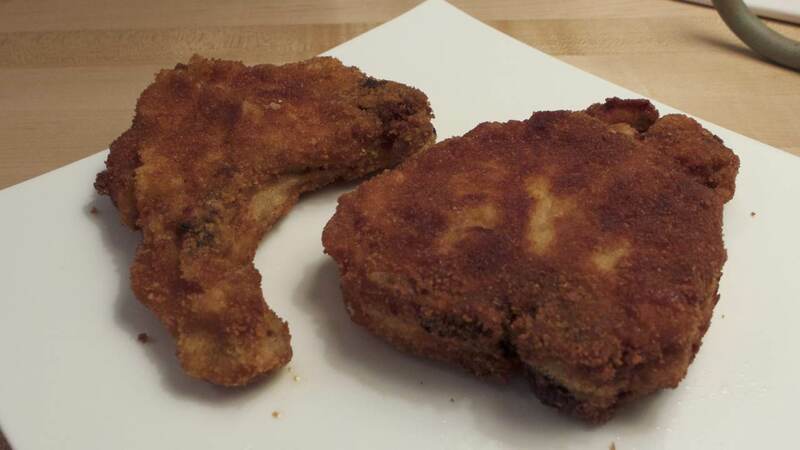 Fried pork chops: I used panko bread crumbs for the breading. To bread, I started by covering the chops with flour, then dredged the chops in a beaten egg, and finally coated generously with panko crumbs. 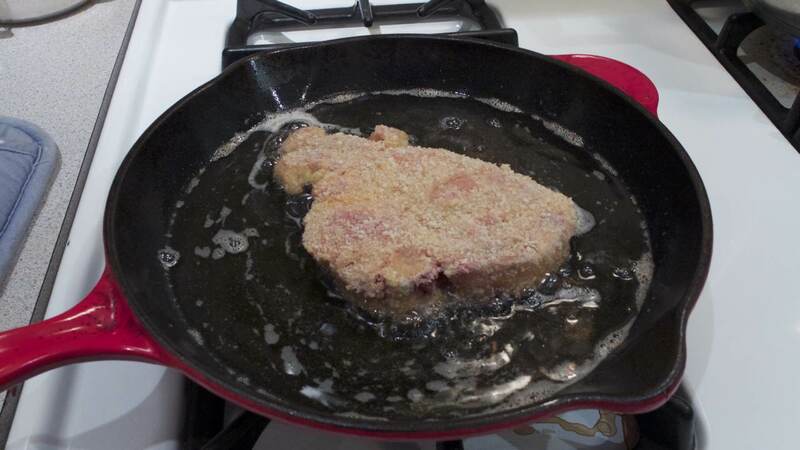 The flour and egg form “food glue,” making it easier to stick panko bread crumbs to the chops.